Rainfall: Rainfall projections in summer show an increasing trend over both upper basins, with an increase of about 5–10% over the southern areas where the normal precipitation is low. 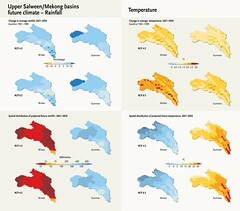 In the upper part of these basins where the normal precipitation is higher, the projected increase ranges from 10–25%. Rainfall projections in winter also show increasing trends of about 10% over most parts of the basins. However, a small area over the southern part of the central area of the basins shows a decreasing trend by up to 5%. 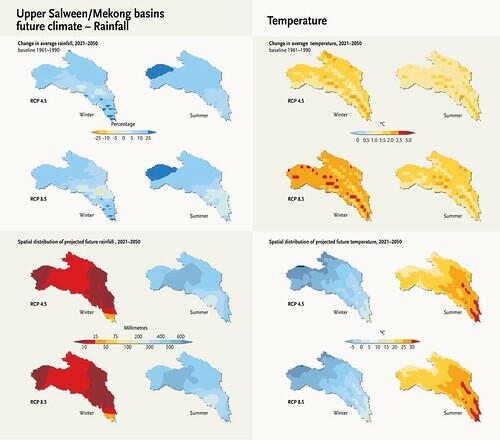 Temperature: Future warming in the summer season is projected over the entire upper Salween and Mekong basins, mostly in the range of 1.5–2.5°C, although it may exceed this in some pockets. RCP 8.5 shows a greater area with warming of between 2–3°C than RCP 4.5. Greater warming is projected in the winter than the summer, although the scenarios differ: RCP 4.5 results in projections of warming between 1.5–3°C, while RCP 8.5 results in projections of warming of 2–3°C or higher.